Appleman Eric M. 2000 “The Rest of the Primaries” http://www.gwu.edu/~action/chrnothp.html (December 24, 2002). Brock William E. 2000 “Nominating Future Presidents: Report of the Advisory Commission on the Presidential Nominating Process” http://www.rnc.org/media/pdfs/brockreport.pdf (February 13, 2003). Center for Governmental Studies 2001 “Report of the National Symposium on Presidential Selection” http://www.centerforpolitics.org/reform/nssreport_entire.pdf (February 1, 2003). Congressional Quarterly. 1960 “How Delegates to National Conventions are Chosen” February 12, 225. Congressional Quarterly. 1968a “Democratic Presidential Primaries” June 14, 1480. Congressional Quarterly. 1968b “Republican Presidential Primaries” June 14, 1481. Congressional Quarterly. 1968d “Republican Presidential Primaries” August 16, 2147. Congressional Quarterly. 1988c “1988 Democratic Primary Results.” July 9, 1894. Congressional Quarterly. 1988d “1988 Democratic First-Round Caucus Results.” July 9, 1895. Congressional Quarterly. 1988e “1988 Republican Primary Results.” July 9, 1896. Congressional Quarterly. 1988f “1988 Republican First-Round Caucus Results.” July 9, 1897. Congressional Quarterly. 1992a “Primary Turnout.” March 28, 823. Congressional Quarterly. 1992b “Clinton Left Behind in Caucuses.” Apr. 4, 899. Congressional Quarterly. 1992c “Remaining Primaries, Caucuses.” Apr 11, 967. Congressional Quarterly. 1992d “Remaining Primaries, Caucuses.” May 2, 1188. Congressional Quarterly. 1996 “1996 Presidential Primary… and Caucus Calendar.” January 13, 98– 99. Gorton Slade, and Joseph Lieberman. 1999 “Regional Presidential Selection Act of 1. 1999.” http://thomas.loc.gov/cgi-bin/query/z?c106:s.1789: (April 8, 2003). Gorton Slade. 2000 “Testimony of Senator Slade Gorton (WA) Before the Committee on Rules and Administration, United States Senate, March 29, 2000.” http://rules.senate.gov/hearings/2000/032900gorton.htm (January 25, 2003). Hirsch J. M. 2000 “Smith Releases Plan to Keep New Hampshire's Primary First.” July 6. http://smith.senate.gov/Releases/Releases/07062000.HTM (January 4, 2003). Klett Rooney Lieber, & Schorling. 2003 “Richard A. Forsten. Biography.” http://www.klettrooney.com/attorneys/alpha/f/forstenra.html (February 13 2003). Lester Will. 2000 “GOP Abandons Plan to Overhaul Primary Schedule.” Associated Press, July 28. http://archive.nandotimes.com/election2000/story/0,3977,500233467-500339806-501946106-0-nandotimes,00.html (January 4, 2003). Levin Sander. 2000 “Interregional Presidential Primary and Caucus Act of 2000.” http://thomas.loc.gov/cgibin/query/z?c106:h.r.4014: (April 8, 2003). Lieberman Joseph. 1999 “Gorton, Lieberman Call for Presidential Selection Overhaul.” Press release, October 26. http://www.senate.gov/member/ct/lieberman/general/r102699a.html (January 4, 2003). Lieberman Joseph. 2000 “Testimony on Regional Presidential Selection Act of 1999.” http://www.senate.gov/member/ct/lieberman/general/r032900a.html (January 25, 2003). National Association of Secretaries of State. 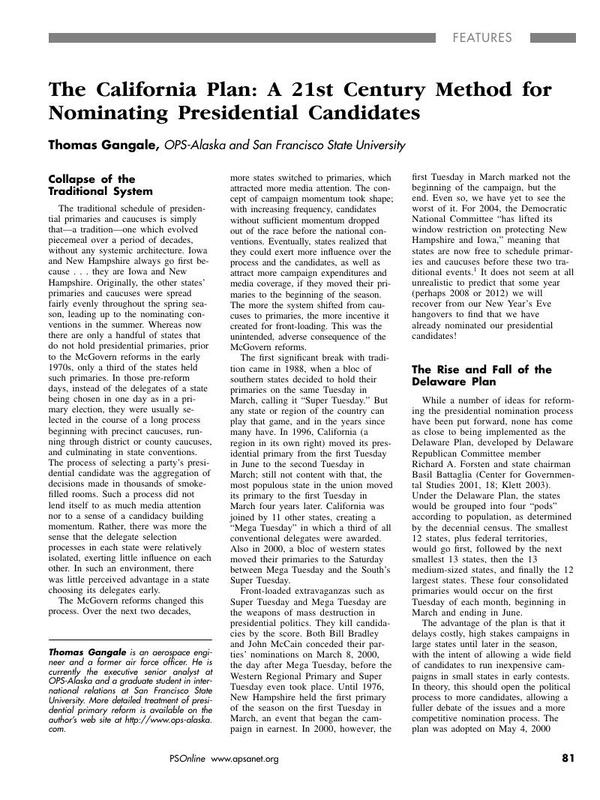 1999 “Model Presidential Primary Legislation.” http://www.gwu.edu/~action/nass.html (April 28, 2003). National Association of Secretaries of State. 2000 “Presidential Primary Plan.” http://www.nass.org/issues.html (December 23, 2002). Parshall Lisa K., and Franco Mattei. 2002 “Parties and the Presidential Nomination Process: Political and Constitutional Implications of ‘Front-Loading.’” Presented at the 2002 Conference of the Southern Political Science Association, Savannah, Georgia. Smith Robert. 2000 “Senator Bob Smith's ‘Fairness in Primaries’ Plan.” http://www.gwu.edu/~action/smithplan.htm (February 1, 2003). Patterson Thomas E. 2000 “Public Involvement and the 2000 Nominating Campaign: Implications for Electoral Reform.” The Vanishing Voter Project, April 27. http://www.vanishingvoter.org/releases/04-27-00prim-4.shtml (February 1, 2003). Washington Post. 1999 “Regional Primary Plan Approved.” February 13. http://wwwwp7.washingtonpost.com/wp-srv/politics/campaigns/wh2000/stories/primary021399.htm (April 1, 1999). Walsh Susan. 2000 “Primary Reform Clears GOP Hurdle.” CBSNews.com, 26 July. http://www.cbsnews.com/stories/2000/07/27/politics/main219401.shtml (February 13, 2003).